London South Bank University (LSBU) has created a fully-automated robotic building companion, a machine which can be left alone to pick up tools, cut and join materials, place parts and finish sophisticated building components, without the need of human hands. The robot is capable of crafting impossible structures and architectural art; it can briskly put together a shelving unit as intricate as a honeycomb or casually carve a fine-art sculpture in breath-taking detail. The robot, based in LSBU's new Digital Architecture Robotics Lab (DARLAB), represents the future of architecture and has many real world industrial applications. 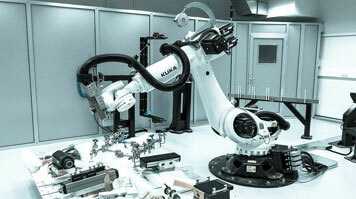 It is also the first robot of its kind to be housed in a UK academic institution. DARLAB was developed by Federico Rossi, Academic Leader for the Digital Architecture Robotics at LSBU, and is run by a project-team of architects, engineers, industry leaders and experts in robotics. Commenting on the new facility, Federico said: "Industrial robots are fascinating architects, artists, and designers due to their complex mechanical, yet human-like motion, but they are yet to be fully adopted as relevant tools in the 'design to production' process in industry." "However, digital fabrication has altered the architectural profession significantly in recent years and architects, engineers and artists all stand to benefit from industrial robots, like DARLAB, that can be turned into intuitive design tools. For the construction industry, DARLAB breaks typical constraints and solves common problems, for instance by implementing digital manufacturing within the design process itself." The first step in DARLAB's building process is for the robot to look at the proposed construction job, then methodically to run an appropriate sequence of actions, selecting tools and processes to build the final part with precision accuracy. The robot is highly industrious and works continuously to complete the task with maximum efficiency, reducing material wastage and ensuring a perfect and reliable build every time. DARLAB is located in LSBU's Southwark Campus and is part of the University's School of The Built Environment and Architecture. It will be used by researchers, industry partners and students, and will be integrated into teaching from October 2015. DARLAB will have an initial research focus on the potential for innovation in custom mass production of non-standard construction elements; an extracurricular module for students will also run each semester, with students devising a construction prototype in response to a live brief. Federico added: "DARLAB hopes to encourage experimentation and collaboration across the disciplines of architecture, engineering and design, expanding the boundaries of standard architectural practice. Our multi-function robotic platform will bring cutting-edge technology to assist makers from all disciplines to obtain the best results in construction. This is an incredibly inspiring facility for students, researchers and industry to have ready access to and I am looking forward to seeing this new technology shaping the future of the industry."